It’s weekend and I’m sure someone is planning on traveling in the house. I was checking out ideas on Pinterest, i saw this cool post that was originally published by THE SNOW CHASER. I’m sure this will be helpful to anyone traveling. This compilations were created from travel bloggers recommendations. 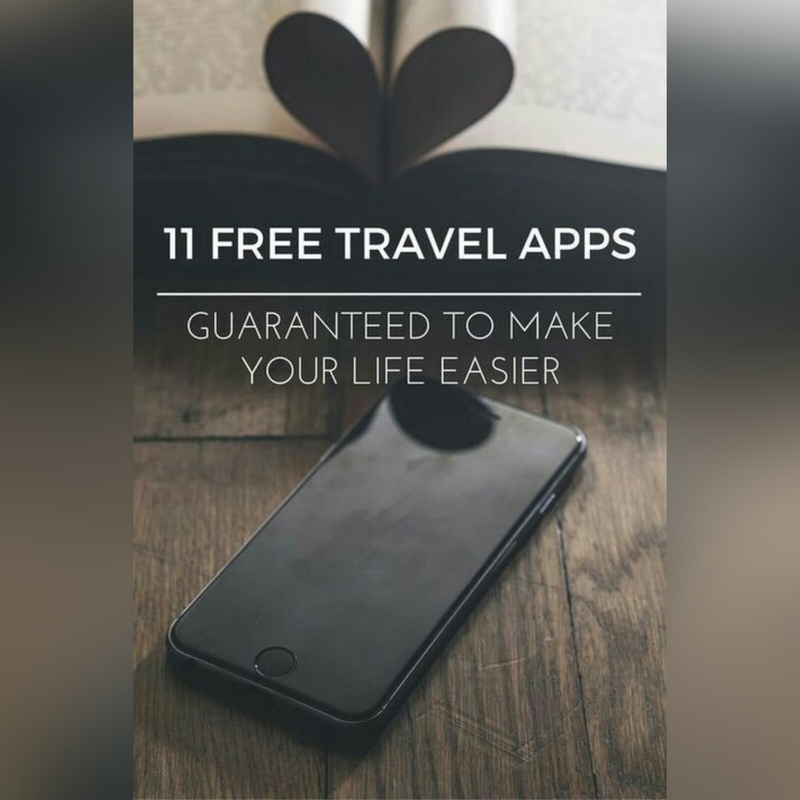 I know there are a lot of free apps for travel out there, and I mean A LOT. If you are the type always wanting to find the quickest and easiest way of doing things, i think this compilation is for u.
I know, it’s an obvious one but it deserves a mention. Google Maps is just awesome and it definitely gets a workout when we’re travelling. I love that it shows you multiple ways to get somewhere, real-time traffic reports and has a great search function. And you can save maps offline for those times you’re going somewhere without a good connection. There are also some crazy functions which I have yet to try like tracking yourtire journey for a year, getting tickets for shows and going on a virtual trek to somewhere. It’s Google, there’s always going to be a new feature or innovation in the works to keep it exciting. Skyscanner has features like “Search everywhere” and “cheapest month” capabilities. Ranks destinations from cheapest to most expensive – this is great for travelers who are open to traveling to any destination around the world. On the other hand, “cheapest month” is great for travelers who are flexible with dates. I love that you can use both features at the same time or just one to find cheap flights. Another feature is Skyscanner’s price alerts. Every morning I get a price alert letting me know of any fluctuations in price. It helps save alot. It’s essentially a notebook on steroids. You can add notes, images and clip web pages all in the one app. I use it to write drafts of blog posts, save articles from websites, clip images, save recipes, save tips on places. You can also add tags or create different notebooks to keep everything nice and neat. Finding all those notes you’ve created is a cinch. The search function is amazing, all you need to do is type in a keyword and it will search through all of your notes in seconds. There is a Chrome extension available which lets you add things to Evernote from the web in one click. Another really cool thing is that when you search for something in your browser, it will go through your notes and bring up anything relevant. Just in case you’ve forgotten that you had already saved something on the topic! You used to be able to use the app across multiple devices but recently they restricted the free version to two. There is a workaround though, you can share notebooks with others. Along with Evernote, Dropbox is an app that can both use daily. Dropbox is a cloud-based filing system which you can use on your laptop, phone and tablet. You can access all of your documents and images on any device. It’s great for storing things like copies of important documents so that you don’t have to carry them around with you when travelling. You can also share files or folders easily with other people which is great especially when the files are too large to send by email. You can sync Dropbox with your phone so that all of your photos are automatically stored in the Dropbox cloud, but I prefer to disable this function so that I save room in Dropbox. Sign up is free and you get a certain amount of free storage space. You can get more storage space by referring friends or you can go to a paid version. TripIt is a nifty travel itinerary app which stores all of your travel plans in a very organised itinerary. Simply forward all of your flight, rental car and hotel confirmations to an email address and it will automatically create a travel itinerary for you. Alternatively, you can set it up so that it will search your emails for confirmations and automatically input them into a master travel itinerary. It will even update your calendar with your trip details if you want it to. I love that you can also share trips which is a great way to let family and friends at home know where you are so they don’t worry. There is a paid pro version which will do even niftier things like real-time flight status alerts, tracking reward points and notifying you when your favourite seat is available on a flight. Recommended and written by Loredana P. from Earth’s Attractions. There are several apps I use while traveling (apps that help me keep in touch with my family and friends, apps that provide guides, etc. ), but one that I find really useful when having to use a car (and I love to travel by car!) is Waze – GPS, Maps & Traffic. I use it almost anywhere – including in my hometown (Bucharest, Romania) – as this app is not just a GPS, but also a great tool to avoid heavy traffic. It is constantly updated with information received from other users, so the standard GPS part is combined with these details to offer each user the best possible route while traveling. Like I said, I’m using this app both in my country and in foreign ones. It’s perfect when you have a 14-16 hours drive to a city you’ve never been before, crossing several countries on the road (and this is just an example of a trip we took.) It’s also perfect for short trips – and so far, this app was used by my family in the US and almost all over Europe and we never had issues with it. Personally i love this app so much and my Spanish is improving everyday. Imagine traveling to another country with different language aside English, this app comes in handy with over 100 of languages if i am not exaggerating. Duolingo is set up almost like a game so you get to learn and have fun at the same time. Perfect for road trips! Ok, this free travel app is pretty new but it’s been winning a lot of awards. With Citymapper, you plug in where you are and where you want to go and it brings up options on how to get there. The walking and cycling options will also show you how many calories you’ll burn and I love that they also compare it to food and drink items. For example 141 cal = 0.8 pints of bitter or 1.2 flat whites. Nice! I might just go and have 0.8 pints of bitter right now. There are also public transport options AND it is integrated into Uber along with estimated drive time and costs. But that’s not all. You can book your Uber right from the app. Wicked. Other cab companies are also included as well as ‘rain safe’ alternatives. Sadly Citymapper is not available in all cities yet, but the list is growing and you can get involved to vote for your favourite city to be next. For those times when you haven’t learnt the phrase through Duolingo and you desperately need to communicate, Google Translate is awesome. Just type in what you want to say, choose the language you need it translated to and boom. You can even press the sound icon for tricky phrases and the app will say it for you. A really cool feature with the Google Translate travel app is it’s camera feature. You can hold up the camera and it will translate signs and text for you. You do need to download language packs though, but they don’t take up much room and will work offline. Last but not least is the Kindle app. Travelling and reading a good book go so well together. There are those times when you are waiting for your flight and need to kill the boredom, and those times where you are chilling by the poolside. The Kindle app is perfect for this and the great news is that you don’t need to own a Kindle to use it. You can load the app onto all of your devices and start reading. What I really like is that if I start a book on my phone, then jump onto my tablet, it will pick up right where I left off. Brilliant. The other reason I love Kindle so much is that there are so many books available including plenty of free ones. I decided to add this two because i have getting a lot of info on these two apps. I have been able to see a lot of cities, islands and so much which has given me inspirations on posts. Tipped by Forbes as one to watch in 2017, this travel app provides inspiring recommendations for every country in the world – you’ll never be short of things to do, places to visit or delicious food to eat! There you have it my lovelies….